The sum of all the cantrefs (in Wales) is 48, except for the eleven cantrefs of Powys and seven of 'Between Severn and Wye' and except for Buellt. In the time of Rhys ab Owain 'Between Severn and Wye' was called Cynllibiwg (Kenthlebiac). Rhys ab Owain ruled Deheubarth may be from his brother’s death in 1072 and certainly from 1075 until his own demise in 1078. The mention of ‘in the time of Rhys’ might well suggest that this was written after his death and before Rhys ap Tewdwr was established in Deheubarth by treaty with King William I in 1081 after the battle of Mynydd Carn. All of this points to the fact that Rhwng Gwy a Hafren was an extant kingdom after the Norman conquest of England in 1066. It is extremely difficult to decide what the status of the area Rhwng Gwy a Hafren was at any time in the Middle Ages. It can therefore be easily surmised that the origins of this region are equally, if not more obscure. This is indeed the case. The surviving evidence, much of it itself suspect and late, throws very little light on the subject, but what there is would tend to suggest that this area of the Middle March, or parts of it, came under the sway of the family of Elystan Glodrydd some time, possibly in the late tenth, or more likely, in the early eleventh century. Brycheiniog also appears to have had its own kings down to at least 934, when the last known ruler of this region witnessed a document at the English court, as his forbears had previously done. By 983 the kingdom would appear to have been recently occupied by Einion ab Owain, judging by the text of the Welsh chronicle. It would therefore appear that Elystan Glodrydd, or other members of this family, did not enter this region until after this date. Elystan himself is a problematical figure, existing nowhere in any sound historical source. The first sound mention of his supposed grandchildren occurs in the late 1070's, when they are merely referred to as the sons of Cadwgan. Much later, under 1116, comes a statement that this Cadwgan's father was one Elystan. Here ends all reliable evidence of this man. Such evidence as does appear in the later genealogies appears totally without foundation, and warrants little further comment beyond its existence. The question of when the ruling dynasty of the twelfth century principality of Cynllibiwg arrived in the region of the Middle March is therefore problematical, although the seventeenth century genealogies do offer some plausible, if unconfirmable, explanations. It is probably fair to assume that Cadwgan ab Elystan was active around the 1040's, and dead by 1075, when his sons were disputing various lands in the Middle March. This suggested dating is supported by the death of Goronwy ap Cadwgan, possibly his last surviving son, of apparently natural causes, in 1101. However it is not possible to suggest when, or if, they actually held any lands in the March. Indeed the overwhelming strength of Gruffydd ap Llywelyn of Gwynedd appears strongly entrenched in the region of the Middle March from at least the 1050's. It is therefore possible that Cadwgan and his sons held no power at all in this period. The charters preserved in the Black Book of Llandaff suggest that the only power in Brycheiniog in the years immediately before the Norman Conquest of England was that of the contending forces of Deheubarth and Gwynedd. Rhydderch ab Iestyn (died 1076), who was claimed to be king of Morgannwg and all Wales except Mon, supposedly confirmed Cantref Mawr, Brycheiniog and Elfael, now (ie. early twelfth century) in the bishopric of St David's, to Llandaff. Before 1063 Gruffydd ap Llywelyn is alleged to have confirmed these claims of Llandaff, and amongst the list of churches after this are included Llangoed in Cantref Selyf, Llangors, Llanfihangel Tal-y-Llyn and 'Llanidoudec Seith' (probably near Llangors) in Cantref Talgarth, with Llowes and Llandeilo Graben in Elfael Is Mynydd. If these copies carry any historical weight, and there is some room for doubt, they would again suggest that the power of Cadwgan and his sons was considerably limited. That said, there are other border areas where Cadwgan, or his sons, may have held sway. Hywel ap Goronwy is credited, in a copy of what may have been an original panegyric, with having reclaimed the family possessions of Ewias, and Ergyng and being the just holder of Brycheiniog. As such this poem does not offer much information about the district two generations earlier, but the previous holder of Kilpeck (Chipeete) was one 'Cadiand'. It is tempting to equate this name with Cadwgan ab Elystan, but such an identification can be no more than circumstantial. Also problematical is the tombstone of a bishop found in Llanrhaeadr ym Mochant. This appears to be decorated ninth century tomb which bares a rough later inscription, Bishop Cadwgan ab Elystan (X Caom filiu Edels). If the body of Cadwgan ab Elystan was buried here he was well out of the bounds of his lands of Cynllibiwg. In 1075, Llywelyn and Goronwy ap Cadwgan along with Caradog ap Gruffydd, fought and lost the battle of Camddwr against the kings of the south, Rhys ab Owain and Rhydderch ap Caradog. J.E. Lloyd long ago placed this battle at the Camddwr between Buellt and Ceredigion. However, such a location would strongly suggest that much of Rhwng Gwy a Hafren was already penetrated by the sons of Cadwgan. As has already been suggested this does not appear to have been the case. Instead the Camddwr in eastern Maelienydd, which flows into the Eithon just below Llanbister, would offer a better location and would fit more easily into the suggested limitations of the apparent power of the sons of Cadwgan. Further evidence supporting this claim is found in local folk-lore which claims that a great battle was fought at this spot between contending Welsh armies. Two years later Llywelyn and Goronwy were defeated, again by Rhys ab Owain, at the unidentified battle of Gweunytwl. From what has been suggested above, once more a border venue seems likely for this battle, and once more folk-lore offers a plausible site at 'bloody field' beneath Crug y Buddais, just north of Felindre. In 1078 the fortune of the sons of Cadwgan may well have changed for the better, as Rhys ab Owain was killed by their neighbours, Trahaearn ap Caradog of Arwystli and Gwynedd, and Caradog ap Gruffydd of Morgannwg, which left Deheubarth in a state of civil strife until the total victory of Rhys ap Tewdwr in 1081. In this climate it was probably possible for Goronwy and Llywelyn to extend their influence into Buellt, Brycheiniog and beyond. Certainly this seems the most likely reason for their appearance in these areas after Domesday. The year 1081 also saw the Conqueror's first and only Welsh expedition which took him as far as St David's, and saw the foundation of Cardiff and its great motte. King William seems to have come to an agreement with Rhys ap Tewdwr on this expedition, and as a result of this at Domesday Rhys (Riset) paid £40, probably for South Wales in the same manner as Robert Rhuddlan owed the same amount for the North. A further sum of ten shillings was paid to the king from the land of 'Calcebuef' over and above the farm. This land may have been either Cantref Buellt, or Cynllibiwg. Unfortunately the ambiguous nature of this text could imply that either Rhys paid the sum, or more likely, someone else. Domesday does, however, offer some interesting information on two hitherto unrecognized Welshmen who appear in the survey under Herefordshire. It has long been recognized that Gruffydd ap Maredudd ab Owain held lands in Herefordshire before his ill-fated expedition against Rhys ap Tewdwr in 1091. He always appears in the Survey, as Gruffydd, the son of King Maredudd. Yet, holding in a different part of the county to his namesake of Deheubarth, there is also one 'Grifin puer', who appears to be different to the son of King Maredudd. This Gruffydd the boy, held two hides of the land of 'Alac' of the large royal manor of Leominster. One Elward had held this land in the time of the Confessor, and Godwin now held it of Gruffydd. This same Gruffydd also held a half hide of Leominster which Elward now held of him. Immediately underneath this entry is another stating that 'Lewinus/Leuewinus Latinarius' held one virgate in Yarpole (Iarpole) of Leominster. Soon after this the two are placed together in a brief summary of the customs both owed for the land that they held. Sometime earlier a 'Lewin' had also held Heath (Hed) in Laysters (between Leominster and Tenbury Wells), but this was now held by Roger Lacy. A tentative identification of this Gruffydd the boy is perhaps possible considering the way the Domesday surveyors appear to have linked him to Llywelyn Latimarius. It is likely that these two were of the dynasty of Rhwng Gwy a Hafren, Llywelyn Latimarius possibly being the son of Cadwgan (first mentioned 1075, killed in Brycheiniog 1099) and Gruffydd the boy possibly being the son of Idnerth ap Cadwgan (mentioned in 1096 in Brycheiniog as a war leader). It is also interesting to see that certain men are rendering money to the king for the waste borderlands they have settled at Hopely's Green in 'Elsedune'; others were settled at Lyonshall, for 'as long as they themselves wished', and Letton. Could these also be some of the dispossessed Welsh of Rhwng Gwy a Hafren, waiting for more favourable times to return to their homelands? 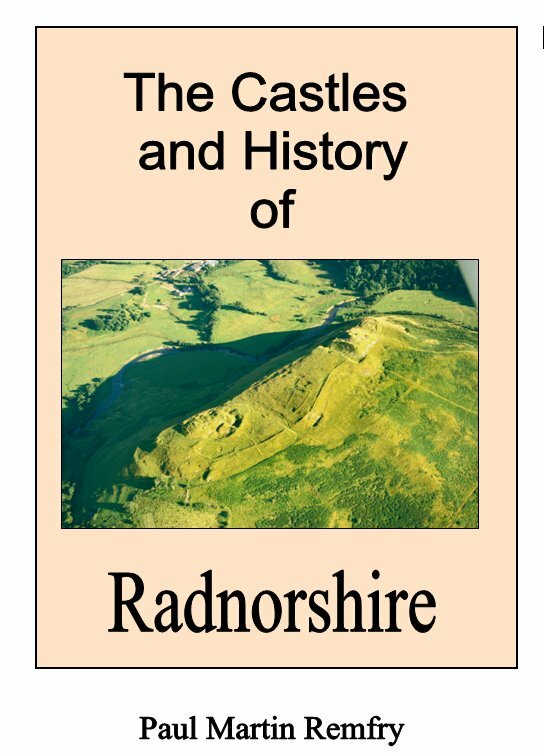 The Castles and History of Radnorshire (ISBN 1-899376-82-8) looks in great detail at the castles of Cynllibiwg. The book consists of 309 pages of A4 and examines in greater detail the history and castles of Radnorshire and Rhwng Gwy a Hafren. Starting in the early eleventh century the book covers the age of the castles up to the Civil War of 1642-46. Each castle description is buttressed by numerous photographs and plans of the earthworks and remains where they survive. A new look is also taken at the battlefield of Pilleth and the evidence for the course of the battle is scrutinised. The book also contains genealogical family trees of the major historical Radnorshire families and a full index.